Slota Bonita! Classic Slot Review - Casino Answers! Slota Bonita is a 3-reel, 1-line classic slot machine found at Random Logic casinos, featuring a wild multiplier symbol. You can play the Slota Bonita classic slot machine at Bovada. Bets on the Slota Bonita slot machine are $0.05, $0.25, $0.50, $1, $2, $5, $10 and $20. You can bet 1-3 coins on the Slota Bonita slot game. You can bet anywhere from a nickel up to $20 per spin on the Slota Bonita nickel slot. Despite the ability to bet up to $20 per coin, you cannot exceed the total bet of $20 on the Slota Bonita classic slot. Slota Bonita has a good betting range for a 3-reel classic slot that is suitable for low stakes as well as high stakes slots players. To play the Slota Bonita slot game, select your bet with “Bet One” and press the “Spin Reels” button or simply press the “Play Max” button to play the 3-coin maximum bet. The top paying symbol on the Slota Bonita casino game is the Gold Cup symbol. On the maximum bet, 3 Gold Cup symbols will pay out the 2000 coin top jackpot. The Gold Cup is wild and will multiply winnings by 2X for one symbol or 4X for two symbols. Use this symbol to win big on Slota Bonita at Bovada! 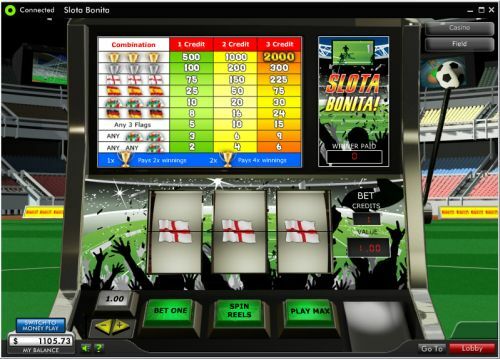 There are 9 winning combinations on the Slota Bonita classic slot machine. The complete payout schedule is as follows (1/2/3 coin payouts in parenthesis): 1 Football symbol (2/4/6), 2 Football symbols (3/6/9), any 3 Flag symbols (5/10/15), 3 German Flag symbols (8/16/24), 3 Football symbols (10/20/30), 3 Spanish Flag symbols (25/50/75), 3 English Flag symbols (75/150/225), 3 Silver Cup symbols (100/200/300) and 3 Gold Cup symbols (500/1000/2000). Slota Bonita is a very well executed football-themed classic slot that football fanatics will get a kick out of. It looks great and has some decent payouts. You can play the Slota Bonita classic slot when you sign up and make a deposit at Bovada. Can USA players play the Slota Bonita online slot for real money? Unfortunately, American players are unable to play the Slota Bonita slot game for real money at this time. However, players based in the United States of America are welcome to read our USA-friendly Global Cup Soccer Classic Slot Review and also play the slot game at Rival-powered casinos including Bovada. Where can I play a flash game of the Slota Bonita free slot? You can play a flash or instant play version of Slota Bonita for free or real money at 888 Casino. If you experience difficulties with the online flash game, make sure you have the newest edition of Adobe Flash Player installed.